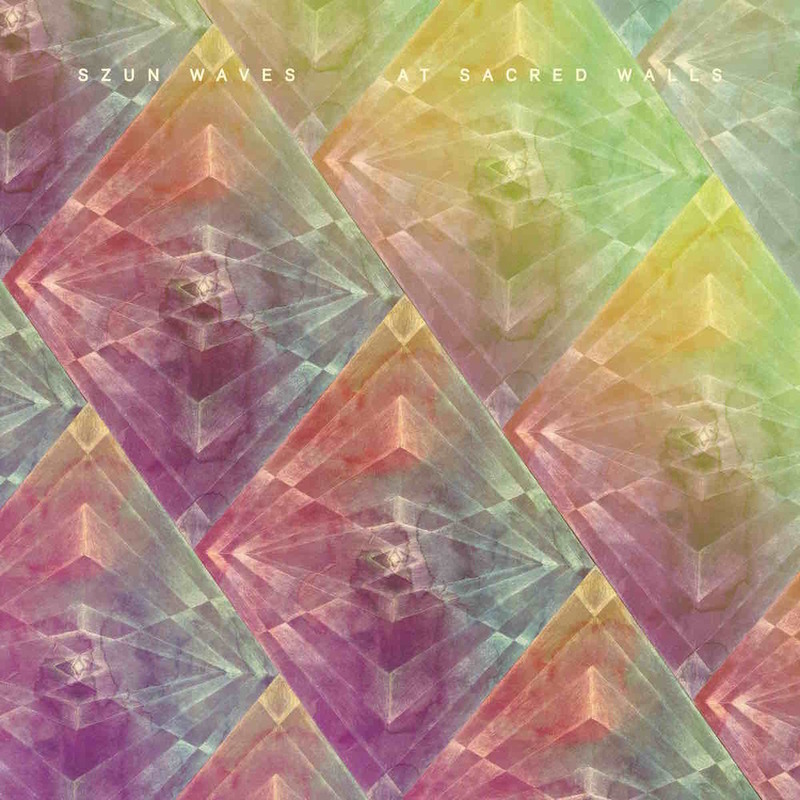 At Sacred Walls Is the debut album by Szun Waves - the newly formed group comprised of electronic producer Luke Abbott, Laurence Pike of PVT and Jack Wyllie of Portico. Luke Abbott and Laurence Pike (PVT) had been talking for a while over email about the idea of doing something together, it was just a case of waiting for the right moment to come along. Despite being located in different parts of the world (Luke in London and Laurence in Sydney), they eventually managed to get together during March last year. Joining up with Jack Wyllie (Portico) who had collaborated with Luke on a prior release, the trio embarked on a three-day recording session at James Holden’s Sacred Walls studio. The 6 hours of sessions were then edited and mixed by Luke into a 6 track LP. Luke’s approach was a largely organic one, choosing to record whatever happened in the very first moments of playing together. He describes the act of capturing embryonic ideas for the first time as “the most magical part of the process” – those initial moments that are instinctively fresh and quite singular. The project presented itself with some challenges, namely successfully coordinating analogue hardware with real-life musicians. Coming from a background of mainly sequenced music, Luke had to find ways of linking his modular synth set-up to Laurence’s drumming and Jack’s saxophone without imparting any strict tempo structures on themselves. By putting midi triggers on parts of the drum kit, Luke built patches in response to Laurence’s playing, and then set about creating a bed of sound through textures and drone layers. This was coupled with Jack running his sax through a chain of electronics to alter the tone of the instrument to help build the layers further. Luke admits, “I have this slightly romantic notion about music being something that is grown (instead of written)”. One will find it impossible to ignore this sentiment when listening through the LP, which is characterised by its open-plan arrangement and very loose, organic cohesiveness. Machines and musicians alike bask in free-form ensemble, eliciting unique timbre combinations and powerfully evocative collages of sound. Though, what is perhaps most remarkable is the seamless way in which it’s all been put together. From the opening 12-minute trip, ‘Further’, to the ethereal ‘Orb Light’, discerning listeners of electro-acoustic and ambient will appreciate ‘At Sacred Walls’ rich sonic content, and welcome its light sojourns into the realms of free-jazz and shimmering psychedelia. Luke Abbott's early immersion in electronic music's more experimental impulses has of course informed all of Abbott's musical output to date, from building his own circuit-bent hardware, midi-controller creations and custom software to the schizophrenic range of electronic sub-species (from 8-bit glitch through to field recording) which adorned his early 12”s. The inherent wonk of his boutique analogue synths and his bolshy, offbeat and polyrhythmic approach to percussion imbued even his earliest creations with an overwhelmingly warm, human and positively homemade character. Far more than just the musical accessory of the moment, for Luke the infinite combinatorial possibilities of the modular synthesizerhas long served as the perfect conduit for his improvisational impulses, its tactile knobs providing the hands-on tools to experiment. Jack Wyllie is a multi-instrumentalist. As a founding member of the jazz/electronic group Portico he has toured globally and released 5 albums receiving various awards, including a mercury music nomination in 2009. He has also released several more dance floor orientated EP's in the group 'Circle Traps'. He had his music used in TV programs, films and documentaries and collaborated with various artists including Jono McCleery, Jamie Woon, Adrian Corker and Luke Abbott. Laurence Pike is a 36 year old drummer/composer/producer based in Sydney. His work is acclaimed internationally with his group PVT (formerly Pivot), who were the first Australian act signed to the influential UK label Warp Records, and the now defunct seminal electronic/jazz trio Triosk. He is a member of Jack Ladder & The Dreamlanders , as well as currently working with ARIA award winner Sarah Blasko, veteran jazz pianist Mike Nock, and UK electronic musician Luke Abbott in their collaborative project Szun Waves.